EVERY child has a strength inside them; it is our job, as educators, to bring this out. “Recognizing ALL Students” is a page designed to showcase the success stories of schools that have moved away from the traditional awards ceremonies and monthly assemblies that only focus on a select few students to a place where ALL students are recognized for their unique talents and interests. Through many conversations I have had over the past year, I have heard “That is great that your elementary school has ended the awards ceremony… but good luck doing that at the secondary/high school level!”. I recently came across Jonathan Martin‘s post at his 21K12 site that describes in great detail the decision that his school, a high school in Tuscon, made to move away from the traditional awards ceremony. I thought their story would be a great addition to the conversation here so I asked if I could re-post his blog on the Wejr Board as part of the “Recognizing ALL Students: The Movement” series. Jonathan is a colleague of mine from the Connected Principals site and a valued part of my PLN. He continually challenges my thinking and is a great example of a progressive, informed educator who puts his learning into practice. Thank you, Jonathan, for allowing me to post your words here:. If you are interested in highlighting your school’s decision to recognize all students, please email me. Recognizing our students for their unique talents as outstanding individuals, creative and compassionate community contributors, and extraordinary intellects is something important to us all. Important also is that we make choices which strengthen and enhance the quality of our supportive and collaborative learning community. We know that students thrive most and learn most when they believe that the growth and the contributions of each of them are valued deeply, greatly, and equitably by their teachers. As each school year ends, it is especially important that we take strong strides to value every learner and enhance our learning community. Traditionally, in the middle school, each and every 8th grade student is individually recognized, appreciated, and honored by a teacher at the lovely promotional ceremony. In the past, our high school graduation ceremonies have only included the naming of each graduate as he or she is welcomed to the stage and awarded a diploma. This year, for the first time, we will initiate a new tradition at graduation in which each and every graduate is personally introduced by a faculty member with thoughtful remarks valuing the graduate’s qualities and contributions. It is my expectation that this ceremony will be warmer, more personal, more affirming, and more uplifting as we put our attention on our fine students, celebrate their accomplishments, and honor their character, scholarship, leadership, and innovation. Last spring was the first time in my 21 year career in which I had the opportunity to observe a school awards assembly or awards process. Neither of the two previous schools at which I taught and served as Head had any awards tradition. I thought our ceremonies, both middle school and upper school, were each lovely in the way our teachers spoke about students and their accomplishments. But it was not evident to me that these ceremonies were affirming and uplifting to the learning of all our students. In the days after the ceremonies, I felt a bit besieged by the disgruntlement the ceremonies created. Parents called to say their children were demoralized, disappointed, or disillusioned by the process. Often expressed was that the process seemed arbitrary or prejudicial, a matter of playing favorites. One graduating senior wrote me a compelling and articulate letter, excerpted below, which I did not feel should be ignored. Today’s awards ceremony was a huge letdown. I understand the goal is to highlight the students that succeed in our school, but instead it ended up making the rest of us feel inadequate and ignored. The awards ceremony made me feel like my accomplishments are trivial. Essentially, today took the wind out of my sails. Graduation is about the ENTIRE senior class and our accomplishments. I don’t want to attend a graduation where my friends and I go unnoticed once again. Please make the rest of us feel like we matter too. I make a habit of reading widely in the contemporary literature of motivation and the psychology of success; to my observation, there is very little reason to believe that awards are motivating for achievement. Research has repeatedly demonstrated that intrinsic motivation is far more effective for life-long passion and purpose than is extrinsic motivation. I highly recommend Dan Pink’s new book: Drive: the Surprising Truth about What Motivates Us, in which he very powerfully explains the evidence that external awards actually can reduce success in higher order thinking skills: offering someone the carrot of a reward to motivate them actually reduces his or her effectiveness and success in completing a higher order thinking, complex task. (Conversely, for very low level, effectively mindless tasks, rewards or awards can motivate in a small way). Stanford Psychology Professor Dr. Carol Dweck, in her terrific book Mindset: The New Psychology of Success, explains how students can be potentially derailed from their growth mindset and into a problematic fixed mindset in school settings where some students are regularly rewarded and others are not. The psychology of all this, not all of which is entirely conscious, is very powerful according to Dweck. Some students may take away from their award exclusion that they are simply not capable of such achievement, and discontinue their efforts. Other students, when winning awards, come to think this is the result of their innate, fixed abilities. In this scenario, these award-winning students can become quite conservative in their learning, choosing not to take risks or try new things in areas in which they might not be successful, because in doing so they will jeopardize their self-identity as an award winner. The most compelling reason to continue awards as they have been, I believe, is because we do know that many of our students have exerted themselves enormously, with great diligence and efforts, and they have accomplished extraordinary things. Indeed. Granting these students awards is a way of recognizing, acknowledging, and honoring these fine students. However, these are often decisions difficult to make, and inevitably there is some ill-will generated in the process, ill-will which does not strengthen our school’s learning community. Parents and students sometimes view the awards as having been decided in arbitrary ways, or by “favoritism.” This concern was particularly prominent in the conversation I had with parents attending the November Family Association meeting. That some deserving students are honored by awards misses the reality that other deserving students are hurt and by their perception their effort is devalued by not winning an award. The good news is that in our new format, each and every student completing our programs, in the middle school and in the school as a whole, as 12th grade graduates, will have their hard work and extraordinary accomplishments acknowledged as is appropriate, in remarks which speak to the unique attributes of each. Graduates will be spoken about, commended and congratulated twice: once in the “senior dinner” at which each graduate is paid tribute to by a pair of teachers, and then at graduation, as they are being awarded a diploma. Some have asked about the importance of awards for our students’ college applications. In the past, 70-80% of all awards have gone to graduating seniors, for whom these awards come too late to have any impact on a college application. Furthermore, our very experienced and knowledgeable College Counselor, Malika Johnson, reports to us that internal school awards like this are not seen by most college admissions officers as significant in their decision-making process (awards granted to students from outside our school community do, in contrast, have significance in the process). Motivated by the many disappointed and dissenting voices I heard last spring, I have conducted a review of our awards tradition over the past several months. I enjoyed extended conversations with the upper school faculty (twice) and the middle school faculty (once); with the Family Association in an open meeting in advance of which we advertised we’d be discussing awards; and with a group of students who joined me for a conversation which I openly announced. In all these conversations, there was very strong support for the changes we are making to the graduation ceremony. At each discussion, many widely varying opinions were offered about awards, but in none of the conversations, by the end, did there continue to be very strong advocacy for continuing the status quo, and in both the faculty and the parent conversations, there was by the end instead a clear majority support for ending our awards process. Two surveys were conducted. One went to parents, announced two times in the e-View, it received very little participation—well under 5% of parents responded. Of those that did, a majority expressed strong support for our awards tradition. 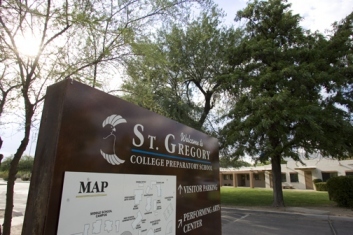 Our St. Gregory faculty members also completed a survey, for which we received nearly 100% participation; of the 35 members of our faculty in the survey, only 4 teachers, 11%, expressed a wish that we continue with the status quo tradition of past year (15% of those expressing a preference). 23% expressed no preference, and a clear majority of our faculty members, nearly two/thirds, expressed a preference to end the status quo (85% of those expressing a preference). With such an overwhelming proportion of our faculty in support of a change; with the strong support for such a change I received from the family association conversation; with respect for the student views that while awards are valued by some it is also understood perhaps they do diminish the sense of student community; and after discussion with the executive committee of the Board of Trustees; I have decided we will no longer have awards at St. Gregory in the way we have in the past. To clarify further, we will not host end-of-year awards assemblies in the middle and upper school, and we will not distribute in any venue a large number of departmental and general student awards. Hence, we are reserving the option on an ad-hoc basis to grant selectively and in small numbers awards at all-school or division meetings, perhaps at graduation or promotion ceremonies, or perhaps at all-school academic pep rallies and learning celebrations. We are also continuing our development of a program of special diplomas for students who commit to and complete a course of study and activity to develop certain skills. These will not be awards decided by teachers and granted to only a few, but will be distinctions students attain by their choice to pursue and their success at accomplishing them. Finally, we will also continue to encourage and support our students in seeking external awards, individually and as part of teams. We recognize that there is great value in our students having opportunity to participate and compete in larger arenas, and although there are still potentially problematic issues of appropriate motivation entailed in such external awards programs, there are not at all the same issues of compromising the learning community that internal awards create. Some in our community will be disappointed about this decision, certainly. Awards are part of our tradition, and awards offer value to highlighting the things most important to a school program, academic accomplishment. Those community members who disagree with this decision are welcome to give feedback or share their contrasting points of view: I value greatly a learning community marked by active, civil discourse and dissent. For me, the paramount values for an educational program are that we seek to motivate students in the best, most well research-supported ways, and that we strive to create a genuinely strong learning community where all feel valued and all feel eager to support one another in learning. Awards, to the best of my understanding and perception, simply do not serve these values.